The FDA estimates that a million hernia surgeries per year are performed by surgeons in the U.S. The Wall Street Journal reports that as many as 30 percent of these patients suffer from chronic pain following the procedure. Further evidence of the many lives affected by faulty hernia mesh has been provided by a new report from England. According to a new BBC report, complications from hernia mesh implants pose serious problems for a similar number of people in the UK. Approximately 170,000 people have undergone hernia repair surgeries involving mesh implants during the past six years in England. The complication rate has been between 12-30 percent, which means that between 67,000 and 170,000 people could experience adverse effects. Hernias involve organs protruding through an abdominal opening or weakened tissue. While a range of factors can cause a hernia, they commonly occur following a surgical procedure where the compromised strength of tissue makes it vulnerable to damage. Hernias can occur in various regions of the body, such as the upper thigh, abdomen, belly button, or groin. These ruptures often cause pain and cosmetic issues. Biologic: The components of this type of mesh involve biological materials like cow heart, pig or human skin, or pig intestines. Synthetic: These types of mesh typically are constructed with polypropylene or polyester. Composite: The two types of materials above are combined in this form of hernia mesh. Synthetic mesh can come in the form of both non-knitted and knitted sheets, as well as absorbable, non-absorbable or a combination of both. While manufacturers design non-absorbable mesh to be a permanent implant, absorbable mesh will degrade and diminish in strength as time passes. How Is Hernia Mesh Used in Hernia Surgery? Two distinct forms of implantation are used to repair a hernia with mesh: (1) open repair surgery and (2) laparoscopic repair surgery. During open repair surgery, the surgeon will open the body to implant the mesh. The laparoscopic approach involves making small openings in the region of a hernia. The surgeon inserts cameras in the openings to repair the hernia by implanting the mesh. What Types of Medical Complications Do Hernia Mesh Cause? 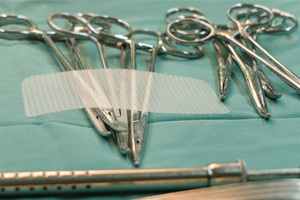 Perforations: The mesh material can cause punctures to the wall of an internal organ or connective tissue. This complication is potentially fatal if not treated promptly. Obstructions: After implantation of the mesh, scar tissue can develop around the medical device causing blockages or constricting blood flow of the large or small intestines. Adhesion: Organs can “bunch up” when scar-like tissue that sticks together develops around the mesh, causing abnormal connections between internal organs, intestines (fistula), vessels, fluid accumulation at the surgical site (seroma), and holes in internal organs (perforation). Hernia Recurrence: When the mesh fails to function as designed, failure of the device can result in another hernia. Mesh Erosion and Migration: When hernia mesh erodes, the device can migrate from its implant site causing perforation, intense pain, infection, and other complications. Contraction: The mesh can collapse so that the area needing reinforcement no longer remains covered by the mesh. Serious Infections: When infections occur because of damage caused by hernia mesh products, this complication can become life-threatening. When individuals suffer complications like those above, they frequently also experience chronic pain and must endure follow-up surgery to fix the hernia, repair internal damage, and remove the mesh. Physiomesh Composite: This hernia mesh product was voluntarily recalled by Ethicon, a subsidiary of Johnson & Johnson, after the company reviewed two distinct studies involving the device. The company’s composite mesh product was associated with a higher rate of hernia recurrence and new surgeries in both studies. C-Qur: The FDA issued a recall for C-Qur mesh manufactured by Atrium Medical Corporation (Atrium) in 2013. While the recall was not a safety recall, the government issued a permanent injunction against Atrium in 2015 based on the company’s failure to address several safety issues. Versatex Monofilament Mesh: The FDA issued a recall in 2018 after the manufacturer, Sofradim Production, received an unusually high number of hernia recurrence reports. Prolite Mesh: The FDA posted a Class 2 recall for Atrium’s Prolite Mesh. The products were voluntarily recalled by the manufacturer. Punitive Damages: This type of compensation might be available in rare cases to punish a manufacturer and prevent similar conduct in the future. How Experienced Hernia Mesh Injury Attorneys Can Help? Although knowledge that the hernia mesh product that you received has been recalled constitutes a strong indication you might have the right to pursue a defective hernia mesh lawsuit, manufacturers can be liable even if their product has not been formally recalled. When you consult with an attorney who litigates cases involving defective medical products, the lawyer can review your situation and assess your potential legal claim. Cases against the manufacturers of hernia mesh and other faulty medical devices can be complicated and costly. The law firm that represents you can review studies, analyze adverse event reporting data, consult with industry experts, negotiate with the company and its attorneys, and guide you through the litigation process. The hernia mesh injury law firm of Parker Waichman LLP currently is reviewing cases involving complications and injuries linked to hernia mesh throughout the United States. We have built a reputation for exemplary results, diligence, and personalized service while recovering more than $2 billion for our clients. Call us at 1-800 YOUR-LAWYER (1-800-968-7529) or email us to obtain your no obligation confidential free case evaluation. Have you suffered from a serious hernia mesh injury?